minimizing use of crystal malts in IPA, [which] adds a level of sweetness and malt intensity that [can] kind of mask the hop character … as the beer ages, the crystal malt immediately turns into that dried raisin, fruit character which really knocks the hop character down. He recommends rye, wheat, or even light Munich malts as a substitute, and says he prefers these malts to crystal in his own IPA recipes. He said that Stone doesn’t often use rye particularly in their beers due to lautering concerns with their brewhouse equipment, but he would like to. I was always under the impression that crystal was more or less a necessity in IPA, to add exactly the kind of residual sweetness that Steele cautions against. Far be it from me to disagree with him, because he literally wrote the book on IPA, and Stone’s selection of great IPAs speaks for itself. I’ve deduced that Mr. Steele practices what he preaches, and the grain bill for Enjoy By IPA – a beer he had significant creative control over as head brewer – contained little, if any, crystal malt. It was that sweetness of crystal malt that I was expecting to find in Enjoy By IPA and missing (well, maybe not “missing”, because the beer was spectacular). I incorrectly identified it as a lack of melanoidin flavor, when it was actually a lack of caramel flavor. Caramel flavors come from using stewed, sugary crystal malts (also known as caramel malts; surprise, surprise) in beer. Melanoidins, on the other hand, are the toasty flavors associated with German beers that one gets from decoction mashing and boiling malts such as Vienna and Munich. Assuming Enjoy By IPA had Munich in its grain bill and not crystal – as per Steele’s own advice – what I was probably tasting was melanoidin. Or at least a subtle, barely detectable background of melanoidin that allowed the hops to take center stage; as opposed to caramel flavors competing with hops for the spotlight in the name of balancing bitter and sweet. Maybe that’s exactly what Mitch Steele realized, leading him to his decree. If so, I like his style; and I’m going to learn from it. My last IPA had 1 pound of crystal malts compared to 1.5 pounds of Munich, a 2:3 ratio. How much better would the hops taste if I changed that 8 oz of crystal and 2 pounds of Munich (1:4)? Or only 4 oz of crystal (1:8)? The real tragedy is that December 21 has come and gone, and I won’t be able to find Enjoy By 12.21.12 IPA again. If I do, it’ll be past date. It seems kind of heretical to drink a beer called “Enjoy By 12.21.12” after the date on the label, doesn’t it? This will be my last post of the year. Happy new year from the Zyme Lord, and I’ll see you in 2013. I have an ever-growing collection of 22 oz and 750 ml bottles of beer cellaring in the Harry Potter closet. I save them for interesting meal pairings or other special occasions (which includes “another Sunday”). So December – a time of parties, good meals, multiple Christmas celebrations and the new year – is a perfect time to catch up on the cellar back stock. By which I mean drink them, of course. It’s also when a lot of breweries release special beers, so I’ve found a few to fill the empty spaces in my cellar as I drink them up. Here’s a quick review of some recent bombers I’ve tasted and bought, and a preview of what I’m uncapping next. This past Saturday, I opened a Stone Enjoy By 12.21.12 IPA. The occasion? Nothing more than resting up after seeing The Hobbit twice on Friday, and a December evening warm enough to put some filet mignons on the backyard grill. Steak and IPA aren’t two things I pair often, especially not when the steak is seasoned boldly (I used some coffee-chipotle rub left over from Thanksgiving), but time was running out on this time bomb of a bomber. The spicy beef and spicy beer matched better than I expected. The beer was light in color, with less melanoidin flavor than I usually want from an IPA, but I didn’t mind the hops overtaking the light malt profile. It was fresh, grassy, floral and spicy. Like a morning stroll through an English garden in spring. With a steak. Then on Sunday, my wife Lisa and I had an early “Christmas” dinner: leg of lamb with garlic, lemon and herbs, which I paired with a bottle of Boulevard Collaboration No. 3 – Stingo that I’ve had for several months. Not knowing anything about “stingo” – a strong English style – except what was on the label, I expected deep malt and spice with a hint of sour tartness. I thought it would be a natural pairing for lamb with a little tangy mint sauce, but I was disappointed. There was some malt roastiness and a tang on the finish, but nothing in between. Not enough malt backbone, not enough depth, and not enough sourness to be pleasant. I had a lot of trouble finishing it, and that’s the first time I can say that about a Boulevard beer. Realizing it had been in storage for a while, I checked the date on the label, and it wasn’t out of date. Just not my thing, I guess. I also bought a few new beers for my collection: a Stone 12.12.12 Vertical Epic Ale, a Brooklyn Black Ops, and a Samuel Adams Thirteenth Hour. I predict at least 2 of those won’t live to see spring. Speaking of not living to see spring, this Friday night (December 21) I’ll open a bottle of Dogfish Head Theobroma in honor of the winter solstice and the end of the Mayan calendar. Since “theobroma” (a.k.a. cacao) is the food of the gods, this should be an excellent way to gain favor with Bolon Yokte K’uh, the Mayan god of war and creation who might be coming to destroy us all. If he is not amused and punishes me for my insolence – or if, more likely, he forgets to show up and the world continues to turn – at least I’ll be enjoying one of my favorite beers. Saturday morning, assuming we’re alive and not already on the Dark Rift road to the Mayan underworld Xibalba, we drive to New Orleans to spend Christmas with our families there. I’m bringing a couple of bottles of Samuel Adams Norse Legend Sahti for Christmas Day. I haven’t tried it yet, but it should be something interesting to introduce to non-beer geeks in the family. The label might even open up some geeky discussion about Norse mythology, which I recommend highly as an excellent conversation topic, especially over grandmother’s Christmas lasagna. Then there’s a bottle of Samichlaus Bier Helles which won’t see any action until New Year’s Eve. January 1 is Lisa’s birthday, and this year she can’t drink to celebrate thanks to our bouncing, kicking bun in the oven. So we’re having a small celebration at home starting on New Year’s Eve. Samichlaus, a rare Helles bock brewed only once each year by Brauerei Schloss Eggenberg in Austria, will be a fitting send-off to 2012: a very special beer for a very good year. I’ve written before about keeping it simple in homebrew recipes. Today I’m doing the opposite. I’m sharing a recipe with a lot of bits and pieces, but for a good reason. Over the course of 2012, I accumulated several open packages of leftover hop pellets. Hops begin degrading as soon as they are opened and exposed to air, and although this degradation can be slowed by storing them frozen in a Ziploc or vacuum-seal bag, that won’t preserve them indefinitely. It’s recommended to use open hops within about 6 months, after which they start to lose their bittering potential day by day as the alpha acids break down. Of course, it’s not an all-or-nothing deal: it’s not like they’re perfectly okay to use on day 180 and then bad on day 181. 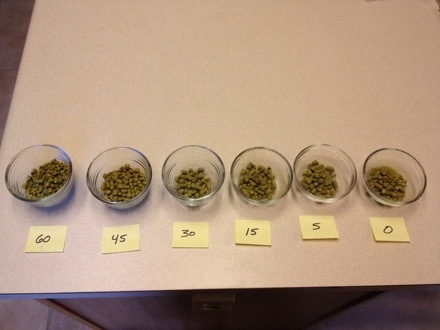 As long as they don’t smell funny – like cheese or feet – hops older than 6 months can be used, but the alpha acid degradation (i.e., decreased bitterness) should be taken into consideration for recipe balance and IBU calculation. Fortunately, many brewing programs – like my favorite, BeerSmith – have tools for calculating the effective alpha acid potency of old hops. So I spent an evening sampling old hops to see how they were holding up, and was surprised to find that the oldest hops in the freezer weren’t the worst ones. For instance, some Saaz and Citra open since 2011 were perfectly fine, but a packet of Warrior from February 2012 was thoroughly becheesed. I separated the good from the cheesy and used BeerSmith to calculate the adjusted AA of the good hops so I could use as many of them as possible in a winter IPA. In homage to new The Hobbit movie coming out this week, I called it Old Took’s Midwinter IPA after Bilbo Baggins’ maternal grandfather, whose memory inspired Bilbo to embrace his adventurous side. I brewed it on Black Friday in the company of my visiting male family while the ladies were at the outlet mall, which seemed like a great way to show my British brother-in-law (a pub operator who knows a thing or two about a good pint) how we do IPA here in the States. That was it for the old hops, and I kept them near the beginning of the boil. The reason being that if there were anything unpleasant about them after all this time, it was better to use them early on for bittering, instead of later in the boil when hops contribute more flavor and aroma. Based on my smell/taste tests, it probably would have been fine, but I didn’t want to take the chance. My first photograph that’s a true work of art. I call it “Oscar Charlie Delta”. The OG was 1.070 and I pitched 15.1 grams of rehydrated Safale US-05 yeast. I set the fermentation chamber to an ambient temperature of 63-66°F and it took off like a rocket within about 12 hours. It fermented very actively for about 8 days before settling down, and once I take gravity readings to ensure fermentation is done, I’ll add more Cascade and Willamette dry hops later this week.